Chateau Canon-Moueix 1985 red wine packed in a wooden gift box. 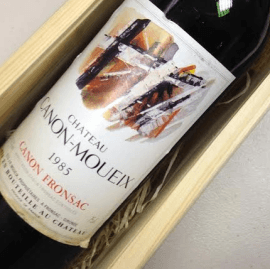 Chateau Canon-Moueix 1985 wine from the region of Canon-Fronsac and bottled in the Chateau. This Canon-Fronsac wine has received good scores from various critics. One of the more sought-after wines from the region.